Identifying hammered silver coinage - Great site showing the basic use of mintmarks and legends to ID coins. Other great books are the 3 additional ones in the Withers set, Short cross pennies, voided long cross pennies and Long cross pennies. From the Iron Age, through the Roman, Saxon and medieval periods, right up to 1662, when reliable machinery for making milled coins took over, nearly all coins produced were hammered. A circular metal blank, the flan, was placed between two dies, one engraved with the obverse and the other with the reverse of the coin to be produced. The upper die was then struck with a hammer and the engraved details were impressed on both sides of the flan. Most hammered coins bear the bust of the reigning monarch on the obverse along with his or her name and title in the legend. The reverse usually bears a design of some sort and often the name of the town where it was minted. In some periods the name of the man who produced the coin, the moneyer, is included. 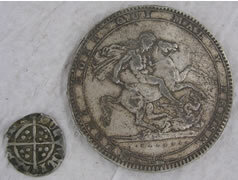 The inclusion of the latter details enabled substandard coins to be attributed to their maker. With the exception of the Commonwealth issues (1649-60) all of the legends are in Latin and are usually abbreviated. Throughout most early periods the majority of hammered coins were struck only in gold and silver (the Roman period being an exception when a good range of denominations was produced both in precious metals and in copper and brass). It was not until 1672, in England, that the need for small change was catered for by the issue of copper halfpence and farthings. A major problem with the hammered coinage was clipping, the fraudulent practice of cutting small parts off the edge of the gold and silver coins. Individuals would then pass the coin on, having made a profit for themselves and a loss to the Crown. At various times measures were taken to combat this, for example, the introduction of the Long Cross coinage by Henry III in 1247 with a cross extending to the edge of the coin in order that any clipping could be easily spotted. The problem only disappeared with the introduction of milled coinage. The term 'milled', applied to all machine-made coins, comes from the type of machinery used, the mill and screw press. Heavy vertical pressure, evenly applied by a screw drive, brought the reverse die into contact with the blank on the fixed obverse die. The first English coins made for circulation by this method were the silver crowns of 1662, which bore an inscription on the edge, DECVS ET TVTAMEN, "an ornament and a safeguard", a reference to the fact that the new coins could not be clipped. The mill and screw press was used until new steam powered machinery made by Boulton and Watt was installed in the new mint on Tower Hill, London. This machinery had been used most successfully by Boulton to strike the 'cartwheel' two- and one-penny pieces of 1797 at the Soho Works in Birmingham. 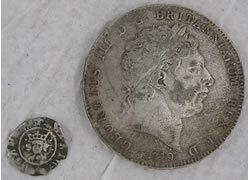 It was first used at the Mint to strike the 'new coinage' halfcrowns of 1816 and 1817. The early 16th century illustration of a working mint shows the various processes involved in producing a hammered coin including preparing the sheet metal ready for cutting the flans, striking - and keeping the paperwork in order! Milled coins are those produced on a machine press and have a regular size. This process became standard around the time of Charles II in the middle of the 17th century. Test milled peices were made in the reign of Elizabeth 1st and Charles 1st. 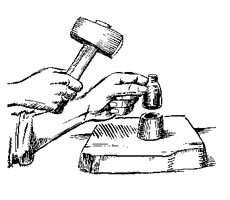 Prior to that coins were made by hand hammering and as there was no collar the size of the coin was irregular. The term milled is also applied to the lines on the edge of the machine-made coins which were introduced to prevent the practice of clipping silver or gold from round the edge.